My early photographs took shape within distinct phases. First was a series of process-oriented light “sculptures” that I photographed over time, marking with tape the transition of light through a window, very much influenced by conceptual-based works created during that period and the beginnings of my research into the time-space continuum. As I began working with video and super-8 film, I created "negatives" from strips of super-8 film that I'd shot, and made prints. 1975. Later in New York, while making performance videos with a reel-to-reel (black & white) Sony portapak, I was shooting images from the monitor. 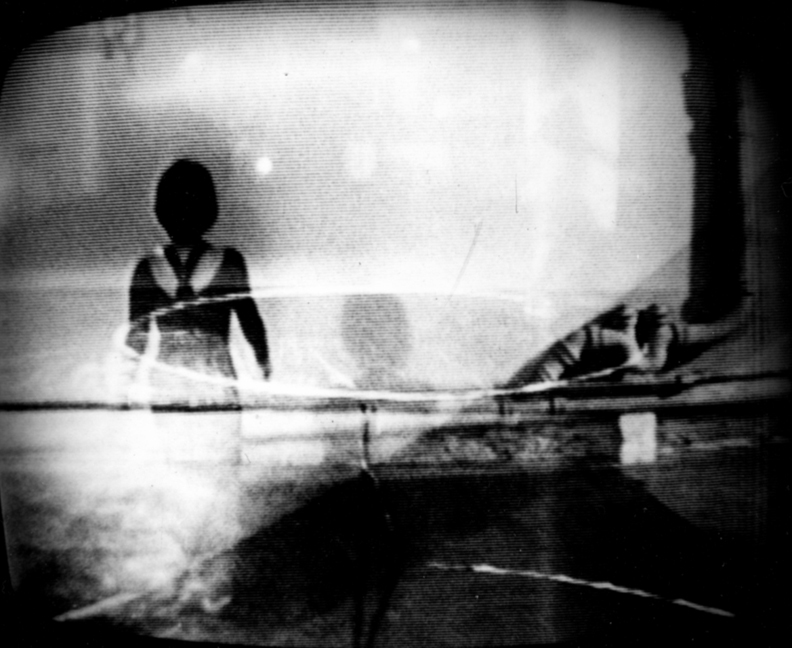 The diagonal stripes across the still frame were a result of capturing the transition between fields of analog video with my 35mm Pentax — at that time images were broken up and transmitted as a series of lines, one after the other, with 525 scanning lines per frame at 30 frames (60 fields) per second. 1978–79.